If you are looking for a big family friendly restaurant, Livestock is one restaurant you should visit! Though not decorated in a super fancy way, I liked its ambience typical of a steakhouse bar that can seat a lot of people and provides a good family chow down joint! It is a place where the food is finger licking good! 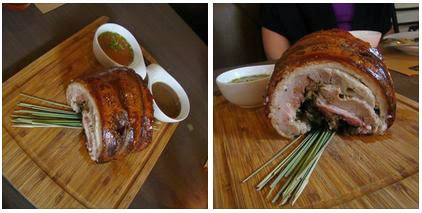 Livestock specializes in ordinary pork meat into some spectacular gastronomic fares. Adobong Quezo Pizza (P 395.00) comes in a crunchy, thin crust with heaps of "kesong puti", sliced olives, minced meat, cherry tomato halves and greens. It's like having an Arugula Salad on a crusty cheese dough! Spiced Pig Tail (P 280.00) is a great tasting appetizer to pique the tastebuds for a fun-biting crunch experience that follows. It is like biting into flavorful mini "bagnets". The pig tail was deep fried to perfection! Livestock's Crackling Pork belly is the bomb! It is a boneless lechon! The pork belly is infused with herb flavors and roasted until the skin comes out red and desired crunchiness is achieved. Perfect for dipping in the spicy vinegar or homemade liver sauce! And you wouldn't want to miss the Crispy Pata! This a generous serving of pork leg delicacy has been deep fried to a crunch! It was well-cooked that the inside meat was tender and so soft! It was easy to cut through into the entire pork and divide it into bite size pieces using just a popsicle! Isn't that amazing? 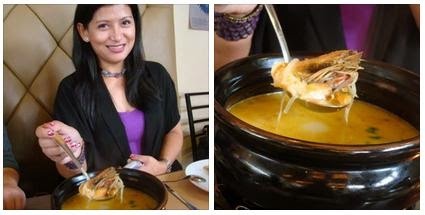 Seafood Laksa (P 290.00)is one delicious soup that would go well with Livestock main dishes. The Livestock version of this popular spicy Asian noodle soup is superb! The vermicelli, prawns, mussels, squid, shredded herbs combine perfectly with the coconut milk to make a tasty soup blend. It was so good that I help myself to hefty servings. The Bacon Ice Cream Sandwich is plain vanilla ice cream on French Toast. It is sprinkled with bacon strips to blend a little saltiness to the sweet dessert taste. Livestock also offers all sorts of imported beer, wine and cocktails to go with their budget-friendly fares. 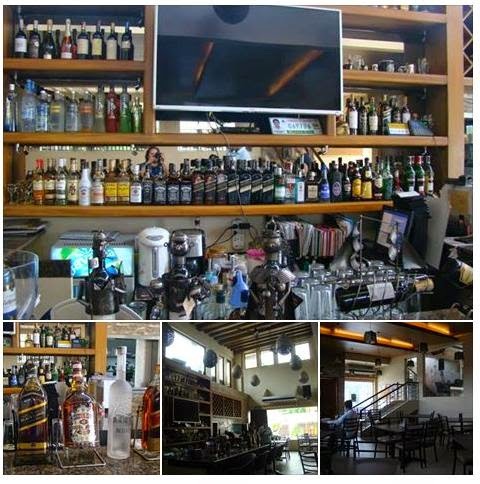 Head on to Livestock to chill out after work or dine in with family on weekends.